Gracie Creations fabricate branding irons in accordance with registration requirements as well as individual numbers. 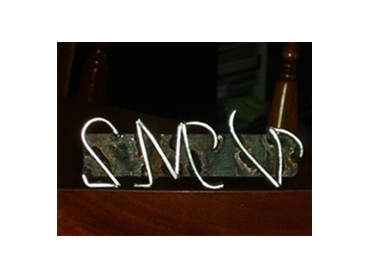 Branding irons with alternative configurations can be provided for those that require some other form of personal identification alongside their registered brand, such as a symbol brand. All branding irons can be made to any height required, within the regulations for the type of animal to be branded, and in either mild or stainless steel. Some find stainless steel to be the best for freeze branding. Each letter or number on the branding iron has a face width of 3mm and stands off the animal by 25mm. Brands for beehive identification and registration are a speciality. All are made to order. Turnaround time for the branding irons is typically 1 to 3 weeks, depending on the complexity of the brand and work flows.